The German-American Stammtisch is a monthly get-together of Americans and Germans living in the KMC. They meet at 6:30 p.m. every first Tuesday of the month at the Paradox restaurant in Ram­stein-Miesen­bach. Actually, a “Stammtisch” is a table, at a restaurant or pub, where guests come regularly to sit down to have a drink and talk. 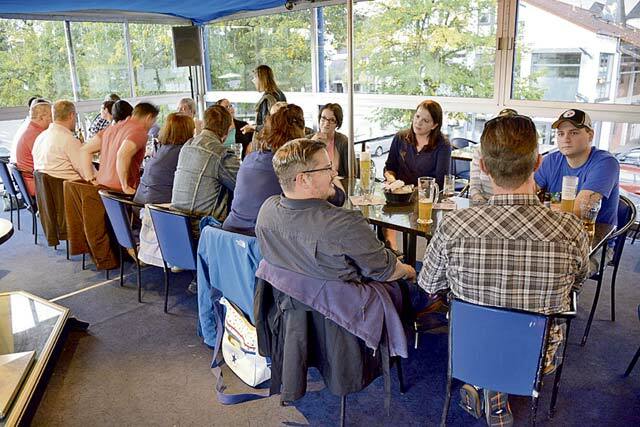 The Stammtisch is a pro­ject of the state initiative, “Welcome to Rheinland-Pfalz! Our neighbors from the USA,” which is sponsored by the Atlantic Academy Rheinland-Pfalz in Kaiserslautern. “One important idea of the Stammtisch is, to involve both Americans and Germans in discussions and asking questions,” Constance said. The December Stammtisch took place at the Congress Center in Ramstein as a potluck dinner in a nice and cozy atmosphere, kicking off the holiday season. Another regular Stammtisch attendant is Marisol Cediel from Ramstein-Miesenbach. For details, visit www.facebook.com/WelcometoRLP, get into contact with the Stammtisch group at https://goo.gl/jB67r9, or email Constance at constance@atlantische-akademie.de. NOTE: Stammtisch visitors parking across the street on the parking lot of NKD and the copy shop, must buy a parking ticket. Failure in doing so will result in a €30 fine.